I can't get away! Just when I think it's behind me, that it's time to move on to new activities, crochet winds its way back into my hands. When I was making the granny squares I was less than organized... not unusual, I admit. I had a stash on the bedside table, some in the car, a few in my purse, or bag, or tote, or basket, maybe in a suitcase, or an overnight bag. Anyway... guess what I found when I (finally) unpacked supplies from our last Maker Faire stint? More squares. About a dozen, finished, granny squares. I've already strung them together and added them to the blue blanket, which feels complete. It's long, and pretty, and done. 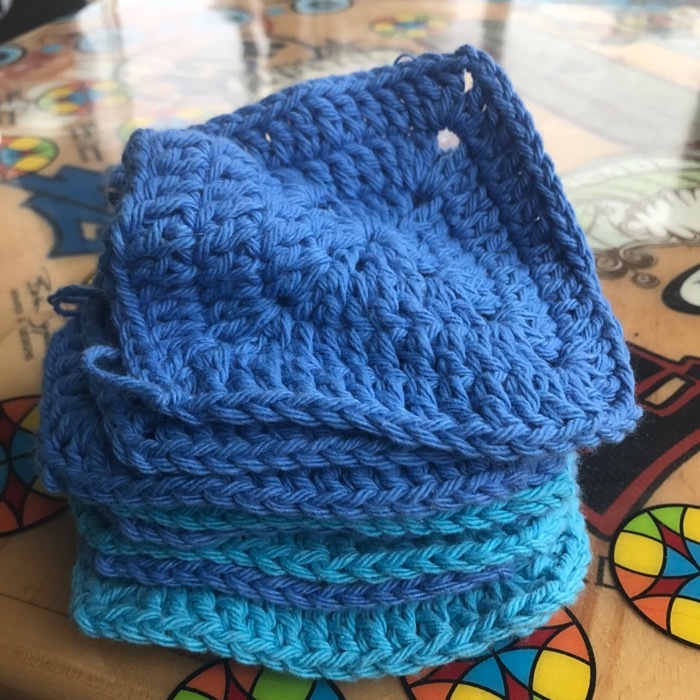 Unless, of course I come across another cache of blue, cotton yarn granny squares. There's no escaping my squirrely habits, or crocheting, it seems. hahahaha... just remembering the other thing about squirrels... I was thinking of how they collect and amass things, but recently someone was saying that they don't actually keep track of their stashes, that it's a hit or miss system! Oh, gosh, how fitting that I compare myself with the little nutty squirrels!